But Ibadan obas said they were not invited to the birthday. Those present praised the celebrant for his sterling qualities and immense contributions to the development of Ibadan and humanity. However, one of the obas, who spoke in confidence with The Nation, claimed that the Planning Committee did not send any invitation to them. He blamed the “oversight” on the Deputy Chairman of the Planning Committee, Niyi Adewole, who also is the counsel to the Olubadan in the case challenging the review of the Ibadan chieftaincy laws. “How will they invite us when the deputy chairman of the committee is the one who is handling the case that took us to court? The other time he was asked some questions about us and he said he did not even know how to address us. But the Chairman of the Planning Committee, Prof Taoheed Adedoja, who handled the invitation, claimed that it was confirmed that invitation cards were sent to the beaded crown-wearing obas. Adedoja, a former Minister of Sports, expressed surprise at the claim by the obas, saying they got invitation cards. At the reception, which held at International Conference Centre of the University of Ibadan (UI), the expansive car park was filled to the brim. Prayers were earlier offered at the Popoyemoja, Ibadan palace of the Olubadan, with the Chief Imam of Ibadan, Alhaji Abdul-Ganiyu Agbotomokekere, leading other clerics to seek more blessings for the monarch and the state. 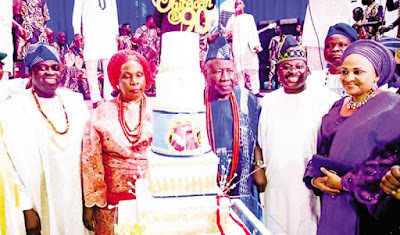 Though other Ibadan obas were absent at the ceremony, the presence of the Osi Olubadan of Ibadan, High Chief Rashidi Ladoja, indicated that the festering crisis over the review of the 1957 Declaration of the Olubadan Chieftaincy Laws by the state government had not been resolved. Governor Abiola Ajimobi described Oba Adetunji as a loving, amiable father. The governor prayed to God to give the eminent monarch longevity on the throne. 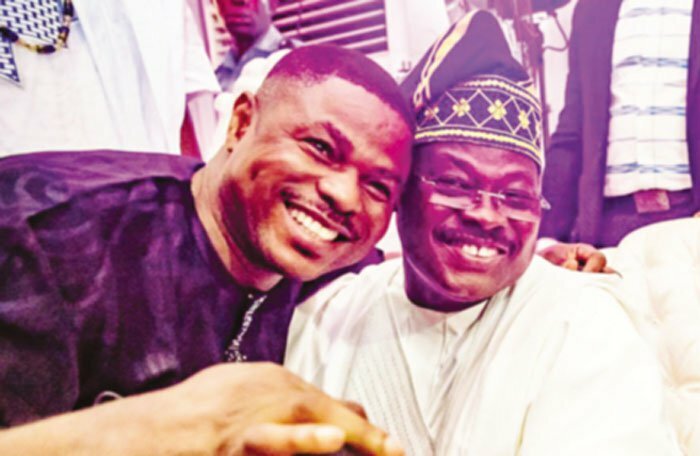 He also promised to repair the partially demolished Music House housing the private radio station, Fresh FM, belonging to popular musician Yinka Ayefele. Ajimobi stressed that he would not want enemies of his administration to use the incident to tarnish its good image. Dignitaries at the event included the Ooni of Ife, Oba Adeyeye Ogunwusi; members of the Council of Lagos Traditional Chiefs, led by Oba Onikoro of Lagos, Oba Adesoji; the Olugbo of Ugbo, Oba Obateru Akinruntan and the Eleruwa of Eruwa, Oba Samuel Adegbola, and many others.